This is my third pair of the classic 76ers. Due to very unfortunate events that happened due to my own negligence. But as expected, they cut like butter. I�€™m very pleased with the pricing and the shipping time. Haircutting is in our family blood, with a Grandfather, 2 Uncles that were professional barbers; another Grandfather who "did" his kids' hair and now myself, who does my husband's and my own hair. Unfortunately, I couldn't afford to purchase any of my late Grandfather's beautiful shop tools, since he passed on while I was struggling to make college funding, but these are the next best thing. They cut better than Grandpa's did. The only downside I've noticed is that they get pretty heated up . . .and they're a bit heavy, but I've never had any professional equipment in-hand to compare with it. Six of the "Wahl-type" clipper sets that you can purchase at a drugstore or warehouse store would not have cost what these did, but there's a very good reason for that--quality. ConsA bit heavy Gets hot with a complete cut. Love it! 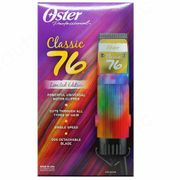 It works great just like past "76" models I have and the look of the tye dyed just makes it fun! ordered and got so quickly. Fun colors and great price! works great!